Personalized Silver Stainless Steel Two Tone Tie Clip Bar Custom Engraved FREE | What Should I Say? This silver tie clip can be engraved with initials, a name or message in any of the font styles shown to the left of the sample picture. How To Send Engraving Instructions: 1) After completing purchase go to "Your Account" on the Amazon homepage and click "Your Orders" in the drop down menu. 2) To the right of your order click "Contact Seller" in the yellow tab. 3) Send engraving instructions in a message. Please include text, font style, instructions/comments for engraving and/or product. 4) Double check and reread text to avoid typos. 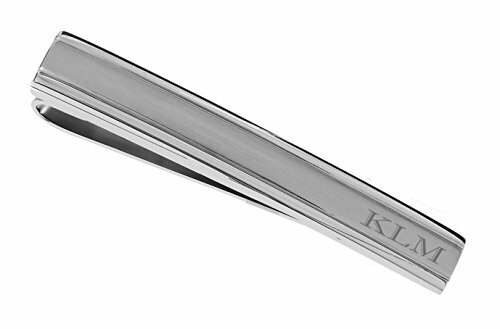 The tie clip can be engraved with any of the font styles shown to the left of the product picture.